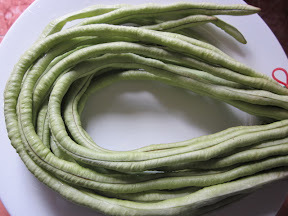 This long green bean could be cooked in many different dishes or we eat them fresh along with Laab or spicy papaya salad. I love to steam them with other vegetables with the marinated fish. My father usually grows them in his garden and for the better taste he will pick them only when they are fully mature. If you want to keep them for some days in the fridge, you should buy the young and greenish color. The fully mature one will taste sweeter when eating fresh but they will be spoiled faster.